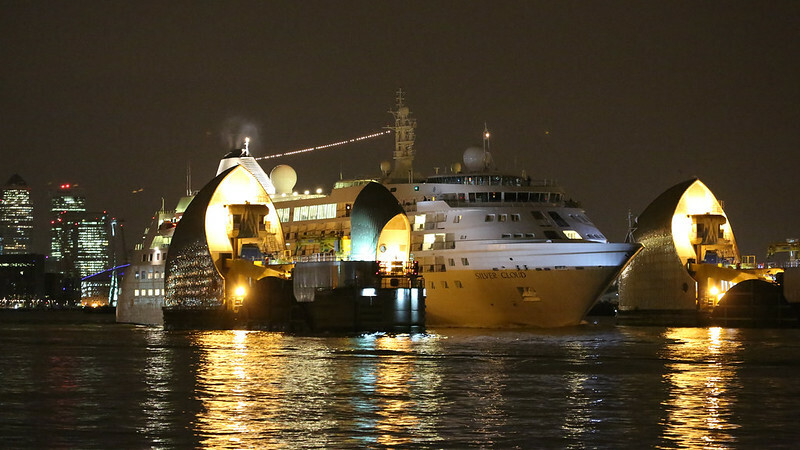 The cruise ship Silver Cloud passed Charlton on Sunday night on her outward bound journey after a one-day stay in the river’s Upper Pool by Tower Bridge. With just a friendly security guard for company, I was at the the Thames Barrier at about 01:30 – just as it started raining – to see the 157m vessel pass Charlton and transit through London’s iconic flood protection gates. The late night trip down the Thames was the beginning of a 10-night cruise of Northern Europe on the Silversea-operated ship with Leith the next scheduled stop on Tuesday afternoon. Other cruise ships to sail past this year have included The World, Fram, Deutschland and Hamburg. Still to come in August and September are FTI Berlin, Seabourn Pride and MS Europa. Cruise ships should become an even more common sight around these parts when the promised redevelopment of Enderby Wharf on the other side of Greenwich Peninsula eventually takes place. There have been predictions that there could be 100 cruise ship arrivals at the proposed terminal every year, although restrictions on the size of ships coming through the barrier mean the world’s largest cruise ships won’t be able to make it to Enderby’s. But despite recent announcements on progress, and suggestions cruise ships may start arriving there next year, it’s perhaps worth noting that there appears to be a lack of available cruises to book now which have the new terminal in their itinerary despite the fact cruises are commonly booked 1-2 years in advance. Previous Article Is the 380 bus getting a little too close for comfort? Next Article Will Charlton road changes give you the hump?